Trumpeter and 1984 NEA Jazz Master Miles Davis (1926-1991) was a life-long innovator with an uncanny ability to discover and employ talented band members, many of whom would themselves go on to fame and fortune. He was always pushing the envelope and encouraging his sidemen to do the same. As a result, his recordings have substantially enriched and expanded the first century of jazz music and undoubtedly will continue to do so as the second century is underway. Between 1945 and 1948, Davis recorded frequently with saxophone icon Charlie Parker, producing many tracks that formed the core of the new music known as bebop. His first session as a leader took place on August 14, 1947 for the Savoy record label and featured Parker on tenor sax, one of the few examples of Bird on that instrument. 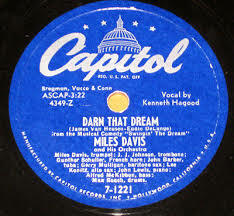 But it is Davis’ next studio session as leader, and two following, all for Capitol Records, that are the subject of this series of essays. 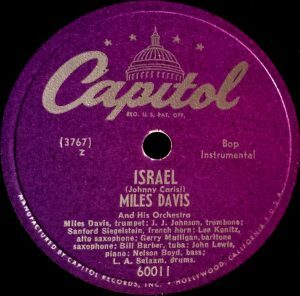 On January 21, 1949 in New York City, Davis assembled a nonet made up of four brass, two saxophones and a three-piece rhythm section to record four tracks that, along with eight more resulting from sessions on April 22, 1949 and March 9, 1950, would make jazz history. Ironically, such a result might not have been predicted based on the initial tepid response to the issued 78-rpm discs. What was unusual about these ensembles was the presence of a French horn and tuba whose sonorities imparted a unique quality to the performances. The horn involvement had its origins in the Claude Thornhill Orchestra of the 1940s, one of whose arrangers was Gil Evans (1912-1988), a friend and kindred spirit of Davis and a contributor to the Capitol nonet recordings. Evans’ New York City apartment was a gathering place for Davis and other forward-looking musicians including Gerry Mulligan (1927-1996), George Russell (1923-2009), John Carisi (1922-1992) and John Lewis (1920-2001) to name just a few. Arrangements for the nonet were provided by Evans (2), Mulligan (6), Lewis (4), Carisi (1) and Davis himself (1), rehearsals took place, and the band performed at the Royal Roost club in September of 1948. 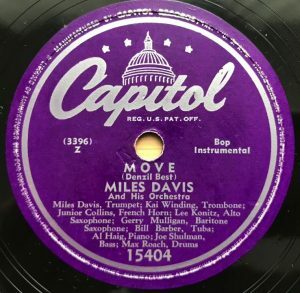 Recordings from two of these live appearances were preserved by “jazz archivist” Boris Rose and issued in 1998 on Miles Davis: The Complete Birth of the Cool, Capitol CD 94550. 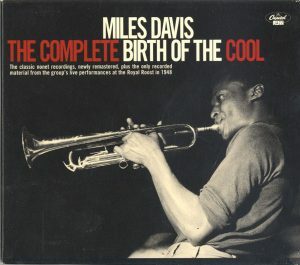 The first association of the ill-defined and controversial term “cool” with the Davis recordings occurred in 1957, seven years after the last of the three Capitol recordings sessions took place, when 11 of the 12 studio tracks were collected for the first time on a 12-inch LP entitled The Birth of the Cool, Capitol T-762 (photo above). The sessions’ producer Pete Rugolo (1915-2011) is thought to be responsible for the enduring title. 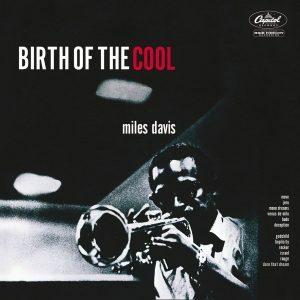 Whether you consider this music “hot” or “cool,” there is no question that it represents one of the earliest and most successful efforts during the bebop era to meld inspired writing with memorable and contextually appropriate improvisations by soloists who would become pioneers in modern jazz. Ensemble size in between the standard bebop quintet and big band with a front line of trumpet and two saxophones augmented by French horn and tuba. Original compositions, many of which were recorded for the first time, some having unorthodox and challenging structures. Complex arrangements with unusual voicings that feature interludes, backgrounds, shout choruses and, in some cases, meter shifts. Improvised solos (generally brief) that are woven into the fabric of the performance. Soloists, especially alto saxophonist Lee Konitz, who were moving beyond the constraints of bebop. It is the purpose of this series of essays to compare and contrast the Davis sessions with several that followed, all having in common similar instrumentation and close interactions between composed and improvised sections. Leaders of these sessions include Shorty Rogers (1951 Capitol; 1953 RCA Victor), Gerry Mulligan (1953 Capitol), Gigi Gryce (1955 Signal; 1957 Columbia) and Teddy Charles (1956 Atlantic). I realize that these choices represent but a small sampling of the many innovative attempts to broaden the horizons of jazz taking place in the 1950s, including the “Third Stream” movement, the “Jazz Workshops” of Charles Mingus, George Russell and others. But to include all offshoots of the Davis nonet would constitute a “book” project of considerable scope and the ones listed have a special place in my personal jazz history, representing some of my earliest acquisitions and subjects of fascination for over 60 years. So let’s take a historical look at the Davis Sessions. 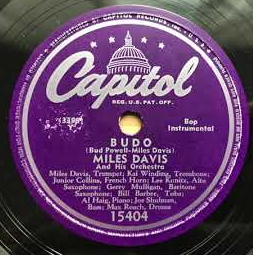 At the time of the recordings, bebop was dominant but would soon be considered stagnant, repetitive and would be supplanted (at least in the eyes of the critics) by the phenomenon known as “West Coast Jazz” (which itself was influenced by the Davis nonet) and then by “hard bop.” Many of the original pieces made their debut at these sessions although few attained the rank of “jazz standard;” however, “Move” and “Budo” could be considered exceptions after highly regarded performances by the Stan Getz Quintet live at Storyville in 1951, issued on the Roost label, gave them greater exposure. An unusual 37 bar (8+8+12+9) structure as written with the bridge comprising 1 bar in 4/4, 1 bar in 3/4, 1 bar in 2/4, 4 bars in 3/4, 1 bar in 6/4 and 4 bars in 4/4; solos are on a 32-bar AABA structure all in 4/4; key of E-flat major concert. The first four bars of the tune bear a striking resemblance to part of Lester Young’s tenor saxophone solo heard at 2:55 of “Sometimes I’m Happy,” recorded December 28, 1943 for the Keynote label (See Sax on the Web). This was the first recording of the piece followed in 1953 by Mulligan’s quartet featuring Chet Baker (Pacific Jazz) and the same year, Claude Thornhill’s big band version of Mulligan’s arrangement of the tune for the Trend label. The first studio recording of drummer Denzil Best’s bebop line took place under the leadership of trumpeter Fats Navarro for the Dial label on November 29, 1948 although the Davis nonet performed it at the Royal Roost in September of that year. While taken at a fast tempo, this is perhaps the most traditional and least harmonically challenging of the original compositions. Pianist George Wallington’s composition possesses a harmonic structure very similar to that of “Between the Devil and the Deep Blue Sea” by Harold Arlen and Ted Koehler and the January 21, 1949 Davis nonet recording is its first. In April of that year, a sextet led by trombonist Kai Winding and including Mulligan recorded it for the Roost label as “Wallington’s Godchild.” It became a staple of the exciting but short-lived Chubby Jackson band and the shout chorus would resurface as “Symphony Sid’s Symphonette” (“Sid’s Swing Symphony”) at a Gene Roland rehearsal on May 17, 1949 (released in 2014 by Uptown Records) and as “Ontet” on Mulligan’s January 31, 1953 Capitol session. The January 21, 1949 Davis studio session was the first for this Bud Powell composition also known as “Hallucinations” and recorded as such by the composer in February of 1951 for Clef Records. While basically an “I Got Rhythm” variant, the bridge is challenging. As noted above, Stan Getz recorded a highly regarded live version of the tune in Boston on October 28, 1951. This piece has an unusual 44-bar (6+16+8+8+6) structure; key of E-flat major concert. 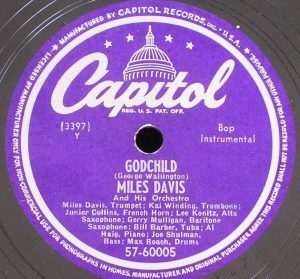 Its first recording was the Davis session of April 22, 1949. It was revisited by Mulligan in 1957 (Pacific Jazz) and 1992 (Re-Birth of the Cool, GRP) but has few other covers. John Lewis’s composition begins with a 4-bar intro in 3/4 setting up the theme in 4/4. 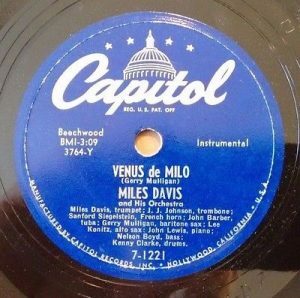 Its recording debut was the Davis session of April 22, 1949 and like “Venus De Milo,” has few subsequent covers. 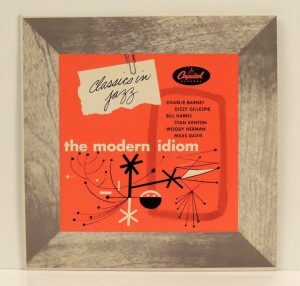 Originally indicated as being composed by Cleo Henry (Davis’ mother), this Davis-Gil Evans collaboration also had its debut at the April 22, 1949 session. Vocalist Mark Murphy gave it lyrics in 1981 (Bop for Kerouac, Muse) and called it “Be-Bop Lives.” Its appealing melody and relative ease of negotiation has led to several covers over the years. Note that on the label of Capitol 57-60011 the drummer is listed as “L.A. Salaam.” Liaquat Ali Salaam was an alias that Kenny Clarke sometimes used. Introduced at the April 22, 1949, session, the only blues among the twelve original nonet recordings has been covered many times, notably by Bill Evans first in 1961 (Explorations, Riverside) and the Mulligan Concert Jazz Band the same year. The composer, John Carisi, recorded it himself in 1956 with an octet for RCA and again in 1961 for Impulse, but the latter was never issued. It should be noted that the nonet’s book included another blues, John Lewis’ “S’il Vous Plait” (actually a blues with a bridge) that was never recorded in the studio but preserved through the live September 1948 recording at the Royal Roost. Derived from George Shearing’s composition “Conception” (first recorded by the pianist’s quintet on July 22, 1949), Davis’ variation extends the form from the original 44-bar (12+12+8+12) AABA framework by 6 bars and inserts ostinati to provide a much different feeling. Interestingly, when the trumpeter recorded “Conception” for the Prestige label on October 5, 1951, he combined Shearing’s structure and his own into a 46-bar (12+12+12+10) hybrid. And his “Take Off” from the March 6, 1954 Prestige quartet session employs no theme but simply improvisations on the 50-bar “Deception” form. Also known as “Rock Salt,” Mulligan’s composition debuted at the March 9, 1950 Davis session and was covered by the composer on January 29, 1953 for Capitol. Other notable renderings of this tune include a live version by Charlie Parker with strings at Carnegie Hall (September 16, 1950, Norgran) and the composer’s arrangement for the Elliot Lawrence big band on March 4, 1955 (Fantasy). This pop ballad was first recorded by Martha Tilton in 1942 and became part of the Glenn Miller band repertoire during World War II. Gil Evans’ dark and moody arrangement for Davis seems to be the first jazz version of the tune. A complete analysis of the nonet studio performance can be found here. From an obscure 1939 Broadway show entitled Swingin’ the Dream, this lovely ballad with its appealing and challenging chord changes became a favorite of jazz musicians and, according to The Jazz Discography, has been recorded over 700 times. One of the first notable versions was that of Benny Goodman, featuring Mildred Bailey, recorded for Columbia on November 22, 1939. 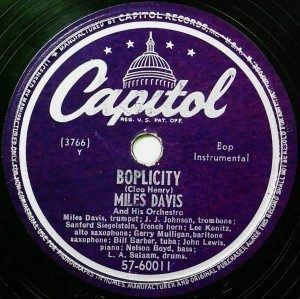 Mulligan’s arrangement is a feature for vocalist Kenny Hagood who worked with Dizzy Gillespie and others during the late 1940s but whose career tailed off abruptly after the March 9, 1950 Davis session. He was not heard from again for a decade. 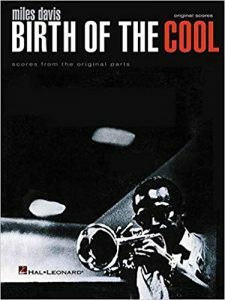 This Mulligan composition and arrangement was never recorded by the nonet but the score is available thanks to Jeff Sultanof in “Miles Davis: Birth of the Cool – Scores from the Original Parts,” Hal Leonard, Milwaukee, WI, 2002. Mulligan’s Concert Jazz Band recorded it for Verve Records in 1961 but the take was never issued and the tape containing it apparently lost. 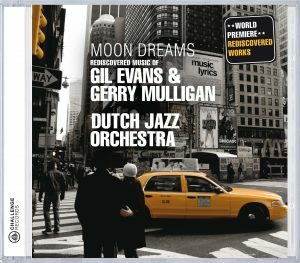 The Dutch Jazz Orchestra covered it in 2006 (Moon Dreams, Challenge (Du.) CD CHR 73275), as did Washington DC-based saxophonist Brad Linde in 2009 (Feeling That Way, Bleebop CD 901). As noted above, by the time of these recordings, Miles Davis had already cut a considerable swath through the fabric of bebop. 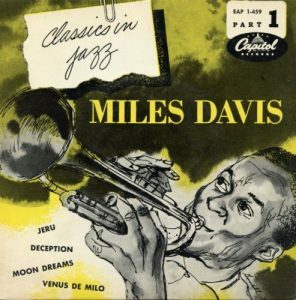 From 1952-1954, he made several recordings for the Prestige and Blue Note labels with the classic session of April 29, 1954 (Miles Davis Sextet, Prestige LP 182) arguably the one that set him firmly on a path to iconic status. Alto saxophonist and 2009 NEA Jazz Master Lee Konitz (b. 1927) began his long career in the 1947 Claude Thornhill orchestra where Gil Evans was an arranger. 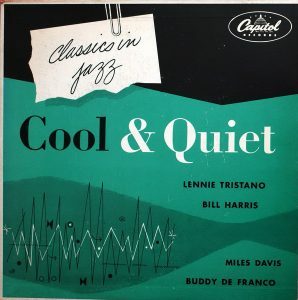 But it was his association with pianist Lennie Tristano (1919-1978) that catapulted him into the limelight starting with recordings for the Prestige and Capitol made around the same time in 1949 as the Davis sessions. 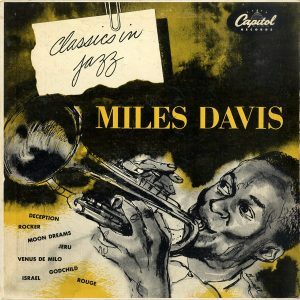 Davis was a member of a Konitz-led sextet that recorded in 1951 for Prestige (The New Sounds, Prestige PRLP 116) and the two collaborated on the trumpeter’s 1957 Columbia Records classic Miles Ahead arranged by Gil Evans. Always a unique and thoroughly original player, Konitz developed a style that distanced him from the bebop saxophonists of the period who were so heavily influenced by Charlie Parker. His was a cerebral approach with a light tone and ideas that began and ended in unconventional places, phrasing across bar lines. In the 1970s he organized his own nonet with a front line of six horns: 2 trumpets, 2 trombones and 2 saxophones. One of the few living survivors of the bebop era, Konitz continues to perform at the age of 90. Another player with a style that is difficult to categorize, baritone saxophonist Gerry Mulligan began his career arranging for big bands including those of Gene Krupa, Claude Thornhill and Elliot Lawrence. His first studio recordings as an instrumentalist were the Davis nonet sessions. Between 1949 and 1952, he worked with Kai Winding, Brew Moore, Chubby Jackson and did a session for Prestige (Gerry Mulligan New Stars, Prestige PRLP 120) before moving to the West Coast where history would be made. The piano-less quartet with trumpeter Chet Baker debuted in 1952 and became an instant success, recording for the Pacific Jazz label (with Konitz added on a couple of occasions). At the same time, he began arranging for Stan Kenton. Mulligan’s tentet recordings for Capitol in January 1953 will be the subject of a future essay in this series. Throughout Mulligan’s long career, he recorded with just about everyone in the jazz world, spanning genres and styles although his only subsequent interaction with Davis took place at the Newport Jazz Festival in 1955. His Concert Jazz Band organized in 1960 is highly regarded for its originality and outstanding soloists. At the time of the Davis sessions, trombonists J.J. Johnson (1924-2001; 1996 NEA Jazz Master) and Kai Winding (1922-1983) were the original modern jazz innovators on their instrument and would actually join forces in the mid-1950s to form the Jay & Kai quintet. Winding and Davis were both in Coleman Hawkins band in 1947 and Metronome All Stars in 1949 and 1951. Johnson’s overlap with the trumpeter is more extensive including recordings with Bird for Dial Records in 1947, Davis’ sextet sessions in 1952-54 for Blue Note and Prestige and the Davis-Gil Evans collaboration Quiet Nights (Columbia CL 2106) in 1962. Al Haig, along with Bud Powell, was one of the first pure bebop pianists and was present on the December 1948 Savoy Bird sessions that Davis also participated in; however; few other interactions between the two can be found. On the other hand, John Lewis was selected for Davis’ first leader outing and the two united for several Prestige sessions in the early 1950s. Lewis, who was with Dizzy Gillespie’s band in 1946, was a gifted arranger and a major figure in the “Third Stream” movement of the mid-1950s as well as co-founder of the Modern Jazz Quartet. A big band veteran, bassist Joe Shulman (1923-1957) played in the orchestras of Glenn Miller, Buddy Rich and Claude Thornhill as well as Lester Young’s quintet. He was a frequent collaborator of pianist Barbara Carroll whom he married. 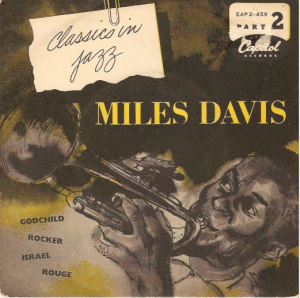 The January 21, 1949 nonet session was the only recording where he and Davis were both involved. Another holdover from Davis’ first leader session, bassist Nelson Boyd (1928-1985) can be found on many of the seminal bebop sessions of the 1940s and remained active into the 1960s. The April 24, 1949 nonet session is the only other studio recording he made with the trumpeter. Al McKibbon (1919-2005) was yet another veteran who had a long and distinguished career performing and recording with Dizzy Gillespie, George Shearing, Herbie Nichols and many others. But the Davis nonet in 1948-1949 was the only time the two recorded together. As for drummers Max Roach (1924-2007) and Kenny Clarke (1914-1985) (both NEA Jazz Masters), let it suffice to say that they were bebop pioneers who changed time keeping forever and left an enormous impression on the jazz scene throughout long careers. And both had many significant interactions with Davis over the years. Another Claude Thornhill alumnus, tubist John William “Bill” Barber (1920-2007) collaborated with Davis on many occasions including the Gil Evans directed projects for Columbia in 1957. He also worked with the Sauter-Finegan Orchestra, Hal McKusick, Gigi Gryce and Evans’ own recordings. All three French horn players had substantial experience in a variety of musical genres and both Addison Collins, Jr. (Junior Collins) (1927-1976) and Sanford “Sandy” Siegelstein (1919-2013) were members of the Claude Thornhill Orchestra, extending that common thread. Gunther Schuller (1925-2015), in addition to being a musician, was a noted historian and author and a 2008 NEA Jazz Master. He was a prime mover in the “Third Stream” sub-genre and constantly involved in projects that expanded the boundaries of jazz. Davis was part of the Jazz-Classical Music Society that Schuller conducted in 1956 and Schuller was part of Gil Evans’ ensemble backing Davis on the Porgy and Bess Columbia recordings the following year. Schuller’s legacy lives on through his sons, bassist Ed Schuller and drummer George Schuller. Throughout the twelve tracks from the three sessions, the main soloists are Davis, Konitz and Mulligan. Winding has two short solos and Johnson, one. On piano, Lewis has two but Haig, none. Having been recorded before the advent of the LP, solo space was limited in order for the tracks to fit on a 78-rpm disc. The live performances are somewhat longer, but even those were constrained by the radio broadcast format. Note 1: Studio recordings only. Note 2: All issues are not shown. Kenny Hagood (v) on d.
Many innovative and critically well-received jazz ensembles had relatively short life spans. Unfortunately, this was true of the 1948-1949 Miles Davis nonet experiment that would never be revisited by the leader. It was also the case for Oscar Pettiford’s 1956-1957 orchestra and the Teddy Charles tentet, the recordings of both groups praised for their excellence but neither able to sustain themselves commercially. Nonetheless, the importance of this music cannot be understated. In the years following the release of the Capitol nonet recordings, their influence would be felt in numerous attempts to move the music forward. Certainly in Davis’ case, these recordings were the precursors of the Miles Ahead, Porgy and Bess and Sketches of Spain albums that set a gold standard for jazz innovation and remain as fresh and inspirational as when first issued 60 years ago. 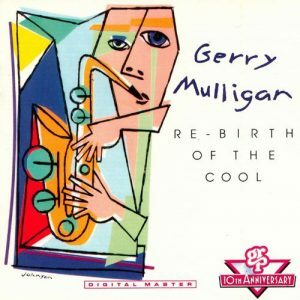 In 1992, Gerry Mulligan assembled a “Re-Birth of the Cool” band, not only recording a 12-track CD reprising all of the studio titles, but also touring extensively in the U.S.A. and Europe. Besides Mulligan, two holdovers from the 1949-50 sessions participated: pianist John Lewis and tubist Bill Barber. Davis’ role was filled by Wallace Roney on the CD and Art Farmer and Michael Philip Mossman on the tour. The classic arrangements from these sessions are available from eJazzLines. The next installment of this series will address the Shorty Rogers recordings for Capitol in 1951 and RCA Victor in 1953. Many thanks to Jim Harrod, Jeff Sultanof, Gordon Jack and Lewis Porter.